A few months back, myself and friend, the lovely Caro, spent some time at the Bankfield Museum, in Halifax. We were there to document the spinning wheels – particularly any great wheels – in the reserve collection. For many years, the Bankfield was legendary amongst textile historians and enthusiasts. The current displays are fantastic – but the museum is less textile orientated, these days and many of the beautiful wheels and other equipment in their care will probably not be back on display again for some time. Our piece about the wheels will hopefully be appearing in the forthcoming ‘Yarnmaker’ magazine, so I will keep schtum about the stunning wheels we saw in the Bankfield’s nether reaches! But I thought these Halifax-made combs might be fun to share. In amongst the lovely wheels, we found a pair of four pitched hand combs. 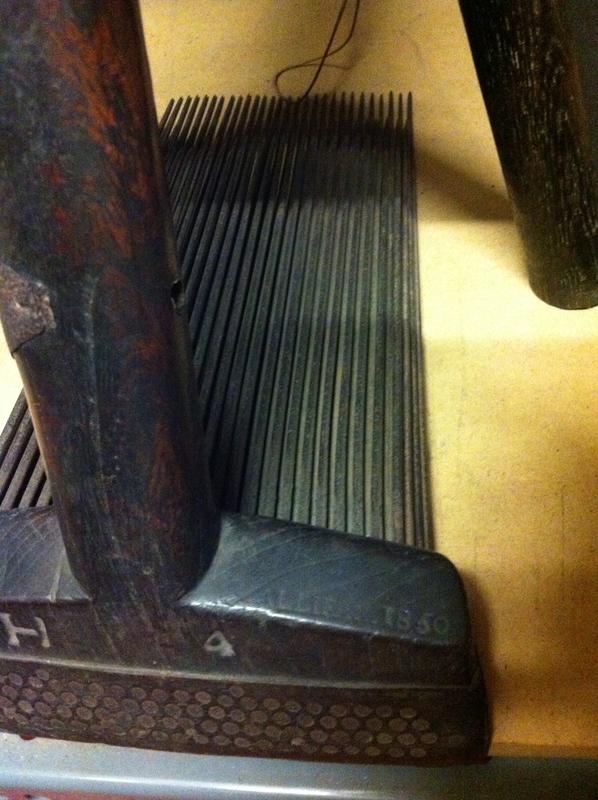 They had a maker’s name stamped on them, which appeared to read: “W RAVEN, Hallifax (sic), 1850”. 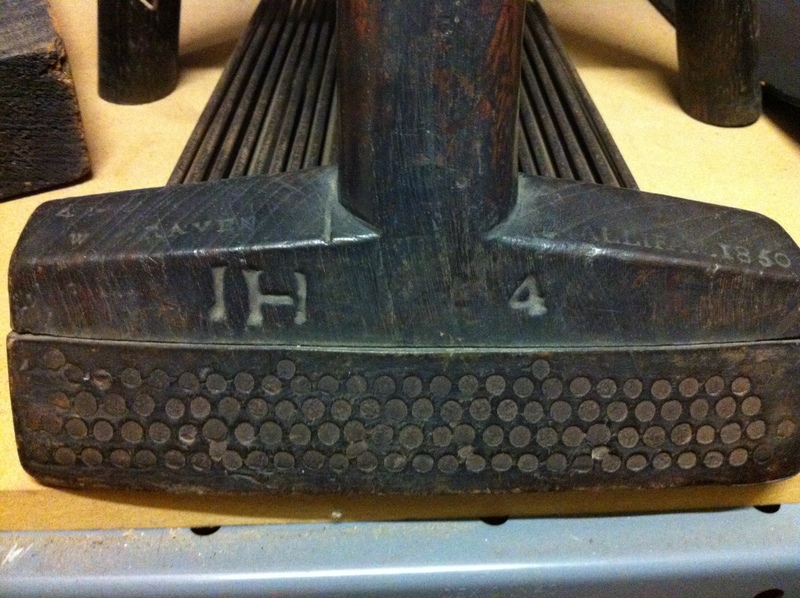 The owner had carved his initials “I H” and the number “4” onto them, too. 4 could refer to a size, or maybe just they had a whole load of combs so was easier to number them. Monumental inscriptions from the 18thC and sometimes earlier 19thC, often have the convention of carving the initial”J” as an “I”, so I’d assume the combs very likely belonged to “John” (Something Beginning With ‘H’)! ‘John’ is a fairly safe bet, just as ‘William’ is for “W” in Yorkshire, at those dates…. I spent some time looking for a “William Raven” in the 1851 Census, hoping he had lived one more year so would be findable. No luck! Couldn’t find him in Halifax Trade Directories online, either. I looked back at my notes, taken on the day and confirmed the combs had “W Raven” stamped into them. So back to look at the for-reference-only photos Caro took on the day. “W – suspiciously long gap – Raven” and the penny dropped. Common local name for Halifax – Craven. Looking for a comb-maker called “William Craven”, I had more luck. William Craven, 5 Bates Yard, Halifax. “ Wool Comb Maker” aged 31, “Master 6 men and 1 boy”. He was born in Halifax, around 1820. He had a wife, Margaret, 36 – and by the time of this census, they had 2 daughters and a son aged 6 and under. A quick look at Halifax’s baptism records showed the births of other children, prior to 1850, who had not survived. By the next census, Margaret was not recorded as “widow” but “married”. This may have been an enumerator’s mistake, as I couldn’t find William. Another thing that made me suspect William’s death was that she was now the Head of her household and “Charwoman”. Quite a difficult transition for a woman whose husband had had seven employees, so presumably a good business, only years before. I’m not sure when the process of wool-combing was fully mechanised, but as late as the 1850s, there seems to have been a brisk trade in English wool combs, as the Trade Directories list several comb-makers for the Halifax area, and presumably Bradford, Leeds and Huddersfield had comb-makers of their own. In 1843, one of William’s children’s baptism recorded him as ‘comber’ but according to a subsequent baptism, by 1845, he was a “wool comb maker”. He may have made hundreds of pairs of combs – it is possible only this pair survive. 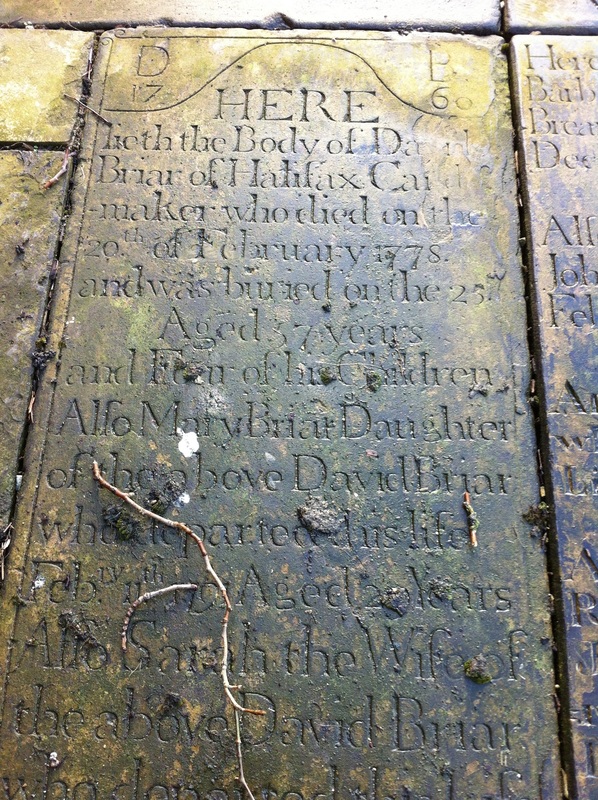 A look round Halifax parish church’s graveyard , and we found many gravestones gave the person’s occupation. Amongst these were cardmakers, woolstaplers and wool merchants. 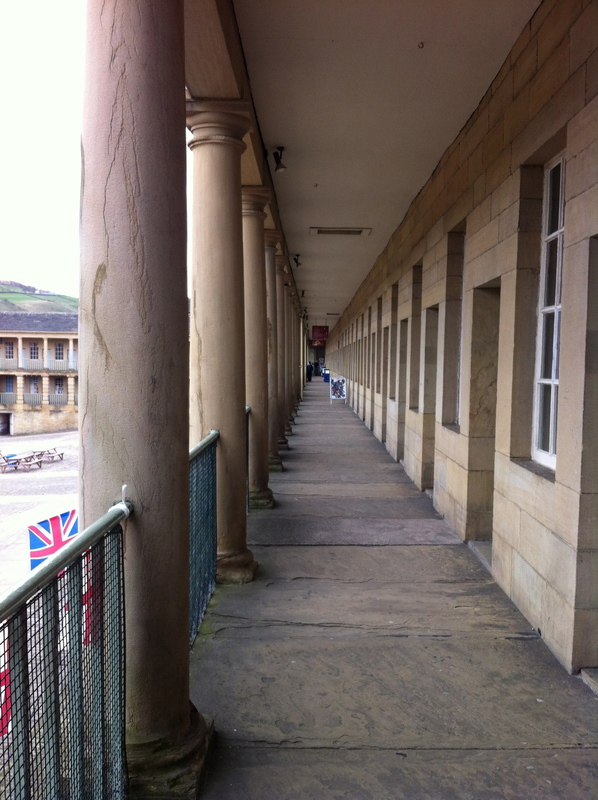 No trip to Halifax is ever complete without a visit to the Piece Hall. And for textile enthusiasts, it is compulsory. I bought my first spindle here in the 1980s. Not realising at the time, even what the ‘Piece Hall’ was! It is one of only two complete cloth halls left in Europe and probably always was Europe’s most spectacular place to sell ‘pieces’ of cloth. Built in 1779, trading went on in whispers (so no-one could hear the deals clothiers were striking) over a period of just two hours, every Saturday. Clothiers hired one of the 315 rooms. Most hand-loom weavers aimed at producing roughly one piece a week. Piece Hall is currently being refurbished. I can’t wait to see it again. I loved Piece Hall for many years before I found out, last year, my great X 5 grandfathers, Eli Crabtree and William Lister, were very likely regulars there, as Halifax weavers in the wool trade. So strange that a random day-trip, some time in the mid 1980s, brought us here, where I bought my first spindle and this whole odyssey began – in my ancestors’ footsteps. Upper storey – each stall is behind a door! In memory of my dear friend Caro Heyworth. This was a happy day spent with Caro, in Halifax, where we re-traced the footsteps of Dorothy Wordsworth in the city (I will write about that one day) and remembering us getting lost on the way back when she had to switch the sat nav over to an Australian accent because she found that “more cheerful”. Caro, you will be forever missed by so many people. Caro, as Dorothy Wordsworth, Dove Cottage, 2011. Read your article with interest as I often visit Bankfield and the Piece Hall as I weave myself, I have been disappointed to see that there less textile exhibits than there used to be. My 4 x G. grandfather William Lister was also a handloom weaver. Val where was your William Lister? My great grandad X 4 was a handloom weaver called William Lister (from Halifax, but moved to Huddersfield). He married Betty Crabtree in Halifax in 1812. I descend from his son Thomas. Any relation? My Listers and Crabtrees appear to have been Non Conformists.